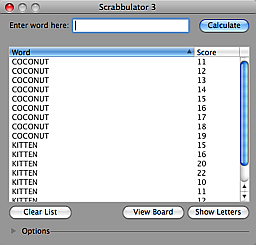 Scrabbulator calculates word values based on Scrabble rules & variations. 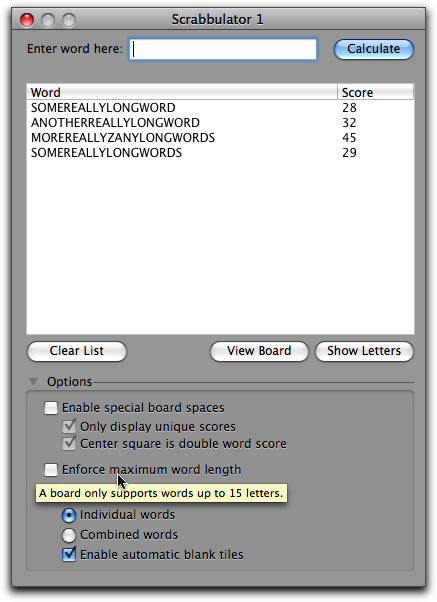 Useful for word puzzlers who need to quickly determine word values, or analyze score sets. 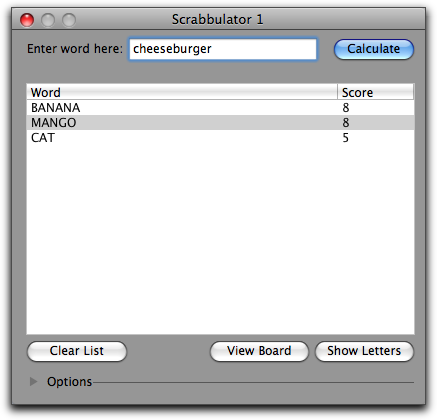 View all possible scores a word canget based on special board spaces. Keep track of how many tiles have been used to set if a series of words is possible. Mac OS X version now available exclusively through the App Store! 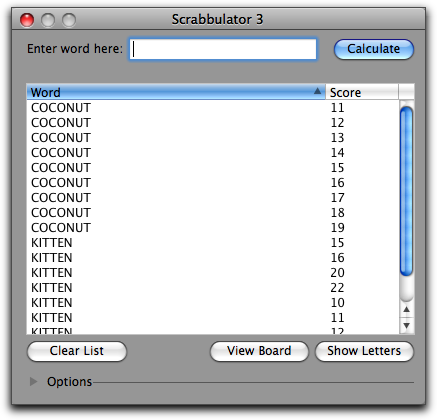 Here you see the basic window providing the base score for a word. 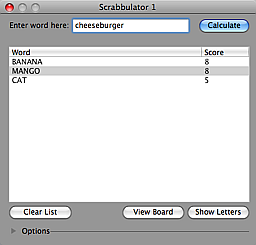 Use this to pick between several different possible words, to keep track of what you've done, etc. You can open multiple windows, and each will be controlled by a set of global options that you set. Each setting has 'hover text' to help explain what they do. The preferences window is also where you enter your registration code. Without a registration code the number of words that can be calculated, and the number of windows that can be open are restricted. Of course you can override the default settings for a particular window by expanding its 'Options' area. 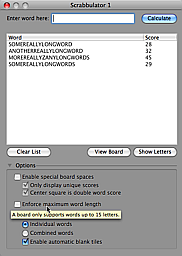 In this example we have turned off the constraint that a word must fit on the 15 space-wide board. 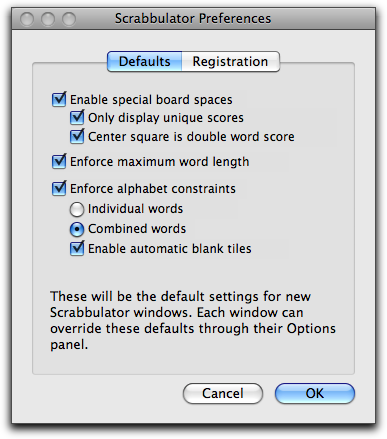 This particular option is useful for word puzzles that are based on Scrabble tiles and values, but not an actual Scrabble game. 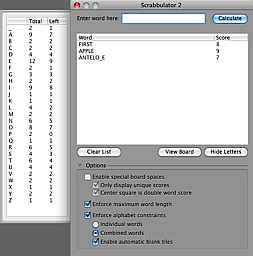 This example shows Scrabbulator keeping track of the available tiles for you. In the letter drawer you can see that the word 'Apple' used both of the 'P' tiles, and then the word 'Antelope' was converted to 'Antelo<blank tile>e' automatically. 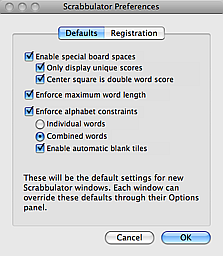 Each Scrabbulator window starts with its own full set of tiles. 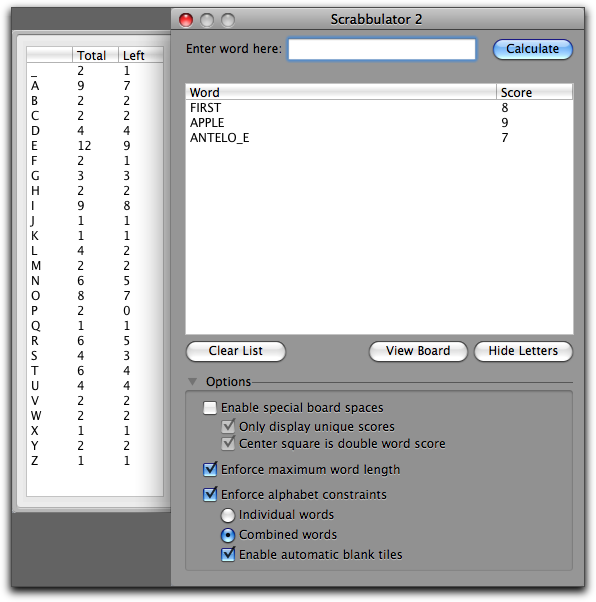 By selecting the 'Enable special board spaces' option' you can see Scrabbulator calculating all possible values of a word, based on the various double/triple letter/word score spaces. Making it easy to see what areas of the board give you those scores is an upcoming feature, not yet available.